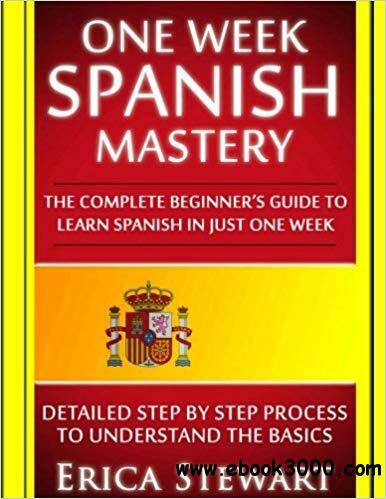 Discover How to Learn Spanish in Just One Week with This Easy to Learn Method This is a Proven Step by Step Method to Learning Spanish as an English Speaker - +1000 Common Phrases Included As an educator for more than 20 years, I'm a fan of teaching others. And there is no greater challenge than to learn a language. Learning Spanish is such a challenge, but enriching on so many levels. It's not only an intellectual challenge, but imagine transforming your travel experiences, allowing you to connect with new and interesting people, or even live or study in places like Barcelona, Madrid, Mexico City or Buenos Aires! In essence, it's a journey to become more open minded about the world, discovering amazing new people in the process. Learning is not the obsessive command of structures and vocabulary, but the willingness to overcome our most basic fears and insecurities. Over the course of this book, I will convey enough knowledge of Spanish so that you will be able to read, listen, and interact with people in this new language with the knowledge that will inspire confidence. In learning Spanish, you will be facing 5 basic but important challenges; grammar, vocabulary, slang and colloquialism, pronunciation and variations of the language. In this book, I will lay out the fundamentals of each of these stepping stones in an easy to understand method. Imagine reading Borges, Cervantes, Neruda, Allende or Coelho in its original form! Imagine heading out to Santiago, Lima or Antigua fully equipped to interact with the locals! I invite you to read on and begin a fascinating learning experience. Here is a preview of what you will learn... Basic grammar and pronunciation, so you will feel comfortable talking in Spanish The fundamental vocabulary that will get you off your feet basic slang and other tips to interact better with the locals! Phrases to use when traveling to Spanish speaking countries Other resources to continue learning and improving your mastery of the language Download your copy today!